Are you having hot cross buns today? Today’s Good Friday, the Friday before Easter, a Christian feast that many people from different cultures around the world celebrate every year. Easter marks the end of Lent, and for many it means spending time with family, going away on holiday, decorating eggs and eating traditional Easter dishes. Eggs are a symbol of re-birth and are synonymous with Easter, when people eat or give away chocolate or real eggs. In some cultures eggs are hidden away by the Easter bunny for children to find. This creature that ‘brings’ these Easter eggs is a pagan ritual and symbolises fertility – it is an age-old tradition that is still practised in the UK and many other parts of the world. 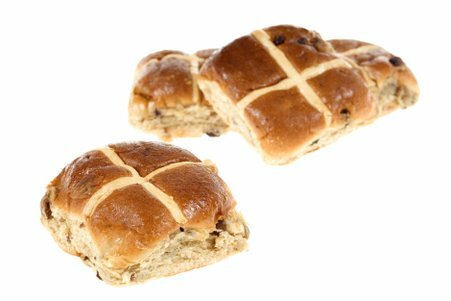 On Good Friday many people eat hot cross buns, a traditional British Easter food. Another popular Easter dish is Simnel cake, a type of fruit cake, which has been around a long time (since the Middle Ages). Now that you’ve learnt a bit about the culinary traditions of this special time of the year you can also explore the holiday from a linguistic angle by having a look at these Easter words. Tuck into your hot cross buns and have a Happy Easter!